Those three words together typically scream “Canada”, not social media, but I digress. While those three explanation were fun and entertaining, I have to say that nothing compares to the image below designed by Avalaucnh Media. Cats have grown in popularity online and have been used in a wide variety of memes and videos, ranging from LOL Cats and Keyboard Cat to the beloved Grumpy Cat. 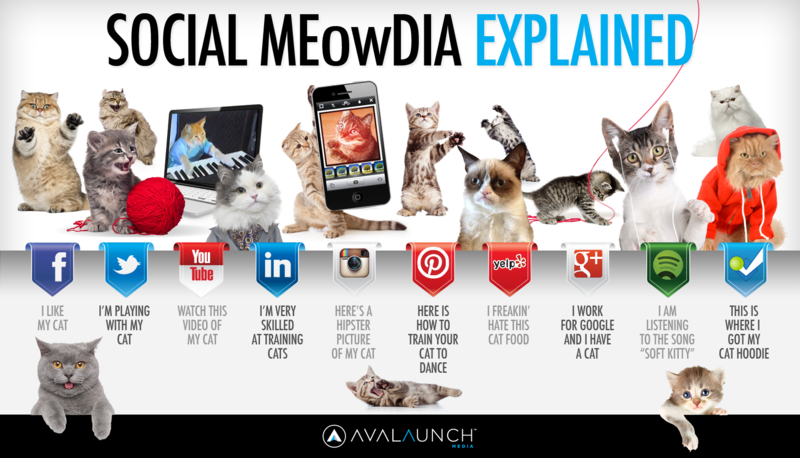 That is why it is fitting to describe major social media sites and application with these adorable little felines. From left to right are the following: Facebook, Twitter, YouTube, LinkedIn, Instagram, Pinterest, Yelp, Google+, Spotify, and Foursquare. Quite true. I launched a cat humor blog only six months ago and with no promotion to speak of, am close to 10k followers. Besides being incredibly expressive, a cat’s personality is probably the most complex of any domesticated animal. Inspiration comes easy. Also I have 18 cats, so am never in fear of “writer’s block”. 🙂 Good article. Thanks for sharing your thoughts! And yes, cats are awesome.